Dee leads a simple life. She doesn’t have any plans that are more than two weeks into the future, her idea of a bank account is tucking money into the pages of a book, and she teaches yoga. Feeling the pressure to get her life together she takes a job modelling for a health insurance company and meets millionaire businessman Ethan. With his help she navigates the business world but she is terrified of long-term. Just thinking about the future causes a panic attack, and as Ethan tries to get closer she pushes him away. 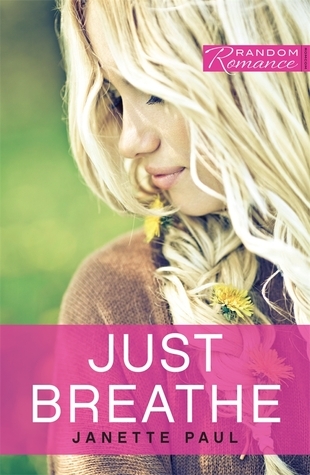 Just Breathe felt a little like two books. For two-thirds the book was measured and felt a lot like chick-lit. The last third was very much contemporary romance. I really enjoyed this book but I think it was a little longer than it needed to be. The author went to a lot of effort to tie off every loose end and personally speaking, I think she really could have just left a few of them dangling. This entry was posted in Uncategorized and tagged chick lit, contemporary romance, Janette Paul, yoga by setaian. Bookmark the permalink.